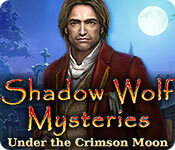 Shadow Wolf Mysteries: Under the Crimson Moon is rated 4.0 out of 5 by 24. Rated 5 out of 5 by Casey48 from Exceptional Game Exceptional variety of games, HOP, memory, challenges, etc., not just the same old HOP! Really stuck to the story line, though I thought the ending was rather surprising!! Highly recommended for fun and entertainment. Rated 5 out of 5 by navajoeyes2 from Shadow Wolf Mysteries; Under the Crimson Moon Great story, it got me right from the start , never let me down. The clothing and set designs, great! Artistry was fabulous. Rated 5 out of 5 by b2u4 from Follows Storyline & great Graphics This game had a gloomy story with a dog & people turning into werewolves but the game & the pictures and all the colors were NOT gloomy looking. Thankfully, there were No dark gloomy areas which I don't like. I did have to check the walk-through twice to figure out why something wasn't working but other than that, I had not help. I believe I have all of the Shadow Wolf Mysteries - true some are better than others but I've enjoyed them all. Rated 5 out of 5 by Yanie1020 from ERS Is Back!! I asked for a challenge, and I got one! I normally refuse to use hints. I'd rather figure it out myself, even if it takes hours. I had to use four hints in this game. Some of this was due to (what I thought was) a technical problem toward the end of the game. All I want to say is, it had to do with a poison dart. (Developers, you know exactly what I mean.) This game deserves five stars, but not because it's perfect, by any means. There are several flaws. But it's the best game I've played in quite a while. I was stumped several times, which is a huge plus for me. It makes me use my brain! The puzzles were fantastic. Puzzles are my favorite part of these games. Some really good, different puzzles are here for you puzzle lovers. There were HOS's, but they were all a little different, so I didn't mind them at all. I really liked the music. Good job ERS! BUT... can't you vary it a little? It was the same refrain over & over again. Throw in something different for each part of the game. Use some new composers. It's a good chance to showcase their work. Now, for the voiceovers... this was some of the worst acting I've come across in a game for a while. It was all so monotonous and unexciting. No way in the world would you believe anyone was in danger. You can do better in this area, ERS. Take the lead from other developers. EIPIX has the best voice overs I've heard. Just a really great game! I played in the most difficult mode, but I think anyone would enjoy this if they stay within their mode of comfort. Rated 5 out of 5 by BanditRedd from Best Shadow Wolf HOG I could not stop playing this game! The best one ever. Graphics were excellent, how the wolves came at you, awesome! Storyline wonderful. A definite buy. Rated 5 out of 5 by grammakk from WOOF WOLF ABSOLUTELY loved THIS GAME. SOOO REFRESHING TO PLAY A GAME THAT FOLLOWS A STORY-LINE. I MUST ADMIT I CHEATED IN THE SKIPPING OF SOME GAMES..SHAME ON ME. MY RECENT FAVORITE AND I HAVEN'T SAID THAT IN AWHILE. AS ALWAYS PLAY BEFORE PAY, BUT I DO HIGHLY RECOMMEND.ENJOY.. Rated 5 out of 5 by Tigerfire_62 from They need to make more like this!!! I liked this one a lot.I wished more were like this one instead of the same old boring fantasy,same backgrounds,storylines yawn fests.The story was fun,the graphics and sounds were great and the tasks and puzzles were different and fun to do.Lately I get so bored with the constant back and forth and same ole same ole that I can't wait for it to end.This one I didn't want to end.It's a keeper! Rated 5 out of 5 by Msflowergal from Really Good! I really liked this game! It wasn't just all "find the hidden objects"--just enough to make it fun. The puzzles weren't too hard that I couldn't get them. My idea of an all around fun kind of game to play! Rated 5 out of 5 by expotanne from Good but not the best I have to be honest and this is my least favourite of the series. I think it's been cobbled together and has only the loosest of threads linking it to the others in the series. That said it was still brilliant. The graphics were top notch and the voices, as per normal, were very good too. The game play was much the same as the others, although I couldn't help looking for morphing objects (too many other HoG's I guess!# I will buy any others that come out because I do enjoy them as a rule. I felt the main game was a trifle short, especially if you've played the others and know what to expect. The 'examining witnesses' was a great new addition as was the 'analyser' for unknown substances. So, all in all a great game with great games and mini-games - you get to mend film clips, take fingerprints, bend metal bars with a wet shirt #small spoiler, but leave you to find the details#. The cut scenes were very well done and I loved them. All I will say as an end is ; "BEWARE CURLY"
Rated 5 out of 5 by pennmom36 from Who's In love With The Big Bad Werewolf? There's another mystery to solve, no worries, I've done this before. Ellis Cote has been attacked by a vicious wolf, not just any wolf, she truly believes this wolf is a werewolf, half man, half snarling wolf! Her own brother doubts they exist, after all, he is a doctor, a man of science and reason, werewolves simply don't exists.....or do they? Tonight is the first night of the crimson moon, a blood moon, and legend has been foretold that because of his cruelty, Lycaon, once King of Arcadia, was transformed into a beastly werewolf by none other than Zeus himself. The blood moon will force the brutal and painful transformation of man to wolf, if this is possible, how will it be possible to stop something neither man nor beast? Everybody loves a good werewolf story, and Shadow Wolf Mysteries won't disappoint you, in fact you just may be on the edge of your seat (computer chair lol) trying to get a closer look at this hideous seven foot Lycan! As a detective you have come prepared with an Analyzer kit, simply put substances in the analyzer that you can't readily identify and answer a few easy questions. Is the substance a gas, solid or a liquid, is the substance toxic, and is the substance natural or artificial, then the analyzer identifies the substance as olive oil, gunpowder etc. Don't worry, if you choose the wrong answer to any of the questions, the lights will flash red indicating that the answer is wrong, and you simply choose a different answer. I found this analyzer amusingly unnecessary because if you know enough about the substance to know if it's artificial or not, and whether or not it's toxic, you could probably guess at what the substance actually is. That's what Detectives do, they analyze things, and naturally people need analyzed or summed up as well, in this case in the form of a mini game where you need to use a magnifying glass and thoroughly scan each new person you meet and click on a specified number of clues such as scratches or gun powder residue (don't laugh, that's how us Detectives, detected in the 1800's) The Hidden Object Scenes are done twice in the same scene with the same requirements both times. The first time you activate a HOS, you may be required to find 12 werewolf related items and the second time you may have to find 12 metal objects in the same scene. The next HOS requires you to replace items back into the scene where they belong, and the second time the same scene requires you to replace different items back into the scene. 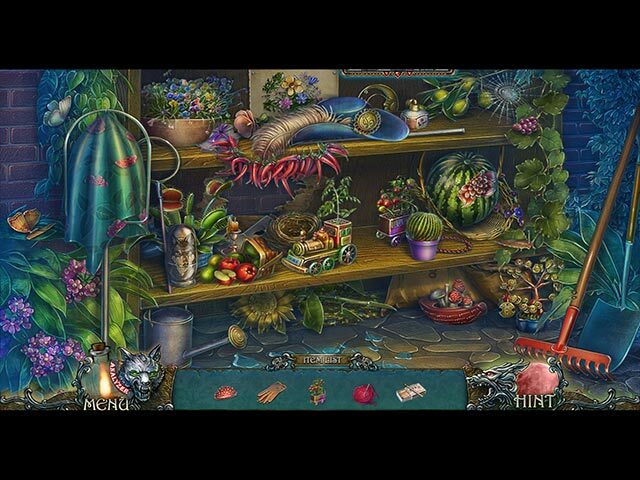 Personally, I get bored when the Hidden Object games are in the same scene. 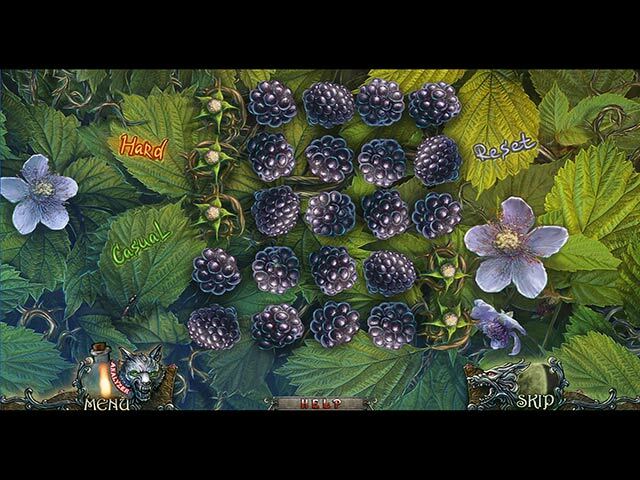 The mini games are entertaining and you can choose either casual or hard modes, the one I liked the most was choosing a blackberry to start with and then use directional arrows to to pass over every blackberry without getting trapped and unable to complete a path over all berries. This edition is by far the better value because I didn't think the Collectors Edition had enough extras to set it apart from a Standard Edition. The CE has the usual wallpapers, concept art, replayable games, but from what I can remember, the only real difference is that there are no achievements in this edition. 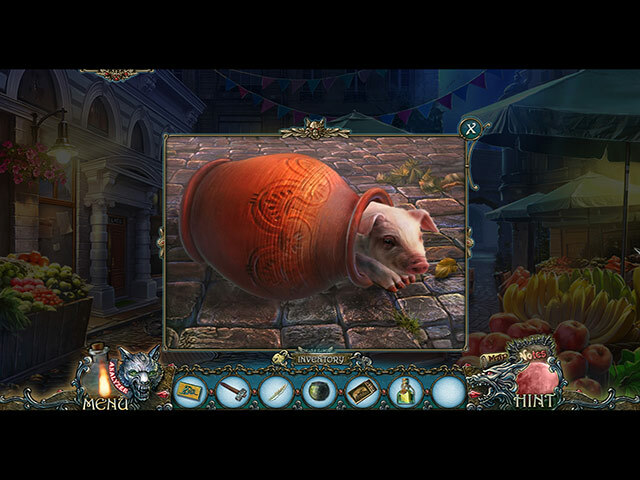 This is a great Hidden Object game that has the option of playing a game connecting pairs of identical tiles with an uninterrupted line, instead of the HOS, enjoy!